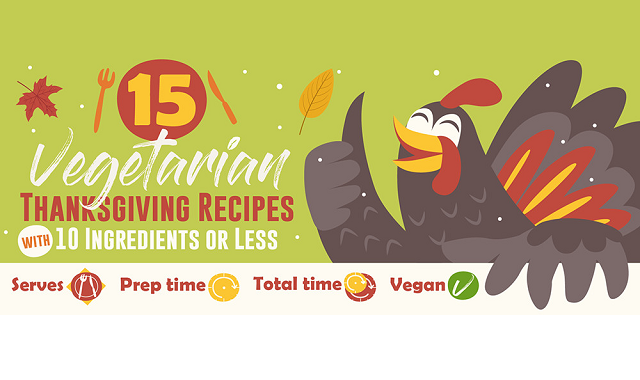 Fantastic Vegetarian Thanksgiving Recipes #infographic ~ Visualistan '+g+"
Is there someone coming to your Thanksgiving dinner this year that's either trying a new lifestyle or is vegetarian? Has Thanksgiving ever been a bummer to you because you don't eat meat? If you're really not sure what to make as a vegan or vegetarian Thanksgiving dish, there are more options than the infamous Tofurky than you think. This infographic from TitleMax.com looks at several options, all of which contain only ten ingredients or less! How's the two-potato flatbread with olvies and feta sound? Or the lentil and goat cheese stuffed sweet potatoes? Whether you're looking for a main Thanksgiving dish recipe, appetizers and sides, or even delicious desserts, this infographic and beautiful recipe guide has got you covered! You don't even need to wait until Thanksgiving to eat these, try them any day of the week, any time of the year!